While working in Ghana back in 2012, I witnessed a distribution of Toms Shoes (here’s my blog post about it), also known as a “shoe drop”. Back then, I assumed their intentions were good and that they might be making a positive difference. I think now is a good time to reflect on this view. 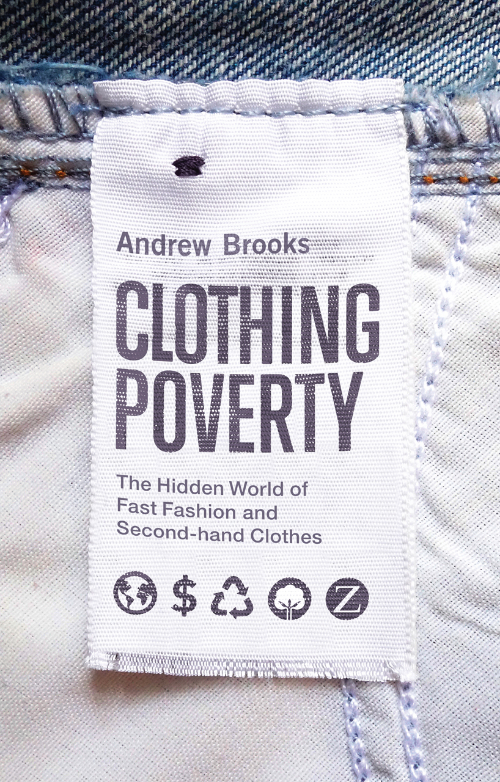 I found Andrew Brooks’ book Clothing Poverty and the podcast Tiny Spark useful in this process and have used their research below. I highly recommend both of them! Clothing Poverty shows how recycled clothes are traded across continents, the companies behind clothing donations, and the myths of ethical fashion, such as Toms shoes. Hosted by Amy Costello, Tiny Spark investigates the business of doing good. Beyond their episode on Toms shoes (which I’ve embedded below), Tiny Spark investigates the world of philanthropy, international aid and development. This is what I was hoping to count to myself on Monday when I walked through town. Unfortunately, my optimism would be squashed. The day before, Mzee, my host grandfather, described the water project he hoped to start in Kabasheshe. Currently, the closest water source is located at the very bottom of the valley; at least 30 minutes there and back, up and down hills. My host sisters (and me on a few occasions) make the journey at least once a day, but more commonly multiple times. Older sisters would carry 20-litre jerry-cans on their head. When full with water, these would weigh 20 kilograms or 44 pounds! I barely managed when I tried. Younger children carry 10- and 5-liter jugs; one or two, depending on their strength. These feats of strength are more impressive when considering that a 2-year-old toddler may also be on a woman’s back. I should also point out for clarity that my household is somewhat lucky in that it is located directly uphill from the community spring. Other families have the dual challenges of living uphill and down the road from the water source, increasing their walking time. If you walk 30 minutes up the road, towards the main junction, you find a completely different reality. 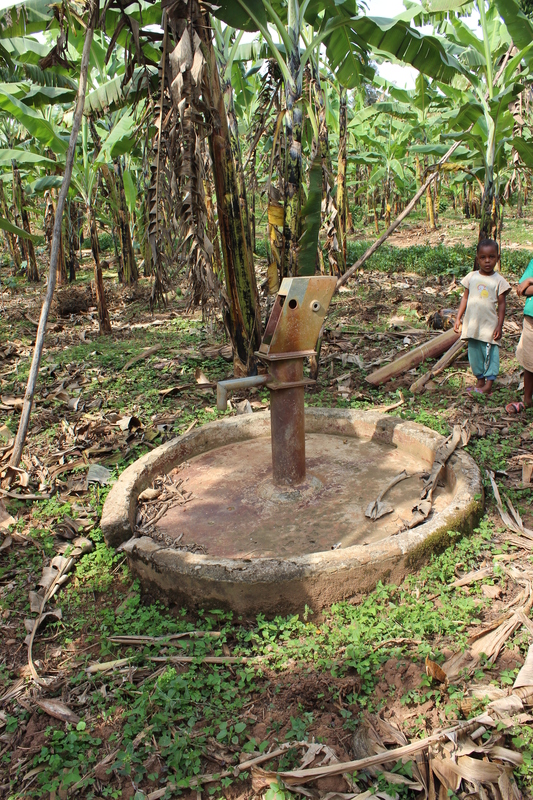 The village of Rusoka seems to be an oasis of water projects – piped water, community boreholes, and others. On our way to see their current gem, my hosts and I passed a centrally placed hand pump. I was told that it was spoiled, not in use. I trust that this is true as I saw nearby pipes ripped out from the ground. After months of no more flowing water, the plastic pumps are commonly extracted; these can then be used by families to illegally smuggle power into their homes or any other use that they can come up with. play pump; age unknown. Play pumps are water projects that replace the typical manual hand pump with a circular merry-go-round, one intended for children to play on. These work when kids are nearby and willing to use it, but are problematic for a woman by herself. It is also a sad part of development that many communities are conditioned to attract international donors, so children may come out to play for photos, but will stop once the abazungus (foreigners) leave. It was interesting to see one, though. If I had more time, I might have tried to uncover its history and current level of use. After walking through town, passing orphanages, training centers, and hair parlors, we arrived at the pump house. This relatively large building provides piped water to the entire Rusoka community. It pumps water uphill to a storage tank and then downhill to several taps. This is the model that my village hopes for. Built many years ago, it has run flawlessly. A cynic might propose that Kabasheshe’s mostly Muslim population missed out on the charity that Rusoka received from Catholic organizations that visited it, being a majority Catholic population itself. A realist might say that Kabasheshe’s location further down the dirt road has left it with worse luck. Rusoka is closer to the main road, which also acts as a pathway between Uganda and Rwanda. Either way, my host village finds itself without easy access to water. 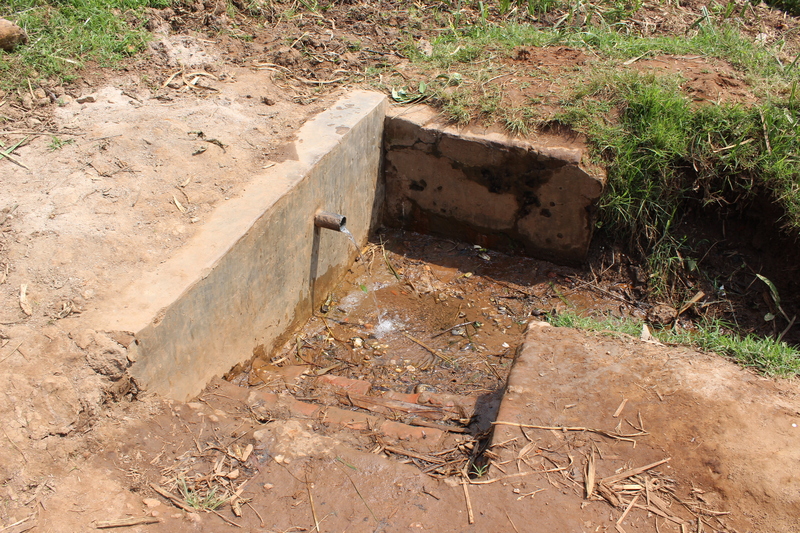 Eight or maybe nine years ago, they did get a borehole, supplied by the local sub-county government. But, after 3 years of use, it broke down and was never fixed. It sits there today, a skeleton of its former self, with all removable components scavenged and probably sold. This is the start of Mzee’s plan. Three years ago, Rusoka received electricity and thanks to a politician who lived here, the line was extended to Kabasheshe. Him, his brother, my host family, and a few others now have power. Power is quite a life changer. It means that you can own a cellphone, as it needs to be charged regularly, and connect with others far away. It means a steady, cheap source of light. And it mean that you can own a TV and relax while watching it, as my host family regularly does. But it also means one more thing, more options for community projects. Rather than the manual water pump that failed in Kabasheshe before, Mzee wants to install a motorized pump to provide piped water to his community. Just like Rusoka. Going uphill, the water would be pumped to storage tanks, either polyurethane or concrete, and then downhill to various sources. Using storage tanks mean that water can still flow, even when there’s a power outage. Also, meters can be placed on the multiple tanks to track usage. After seeing the borehole and location for future tanks, I was taken to see the community taps. There were three of them. Or, at least, that was what I was told. One at the primary school. One at the trading center (local store and outdoor pool hall). And one near a home on the main road. First, the school. Like what I saw in Rusoka, a plastic pipe was sticking out of the ground. After the borehole stopping providing water, someone dug up the line, cut it, and took it home. But, there was hope that a new line could be installed. It would be nice to see this school receive running water, as the alternative is children missing school to fetch water. Next, the family home. We arrived at our destination, but I saw no tap. There was a hedge dividing two properties. A gated house on the left and a small business on the right. It turns out that this tap was demolished after the borehole broke and was in the way of the homeowner’s plan. All that is left is a memory of what was. The third and final tap, at the trading center, had the same fate. It was demolished some time ago. Nothing left to signify that it was ever here. This left me puzzled. Mzee told me about the three taps and my mind raced with possibility. But to have so much infrastructure missing, it would be a daunting project. It is definitely possible to provide piped water to the community. The borehole is there. At least one tap (probably the most important one, in my view) is still in the ground and ready to be connected. And the community wants it. As with most things, money is primary. Funding can come from one of three sources. It can be through the community, everyone pitching in and taking full ownership. The government could come in, but people have little to no trust in them. Or an outside source, like an international charity or aid organization, could be the one to manage the project. All in all, this would be a massive project. Probably the biggest one Kabasheshe has every received. I want to make it happen but have my reservations. Will the village be able to repair future breakdowns? Will they be able to prevent thievery? Is it better to wait and lobby the government to change its ways? What do you think? Is there anything not considered or missing? My first exposure to Uganda consisted of a midnight crossing of the international border that is shared with Rwanda along the three-hour drive from Kigali to Kigezi district. Along with KIHEFO’s driver Enock and four University of Calgary medical students, I filled out the appropriate forms and showed my passport, with a newly acquired East Africa Visa, enough times to make it through the gauntlet of road stops and gunned border agents. With the darkness around us and only a few stars above, we drove the short distance from the border to my new home of Kabale – a southwestern, hilly town of around 50,000 people. I was thankful to be the first one in our van to arrive. It was 1:00 am and I was in desperate need of something other than a car or airport terminal to call home. My apartment companions Trina and Atayo greeted me and gave me the short version of their home tour before calling it a night. I was running on fumes, but took them up on the offer of a shower, as it would be my first in over 72 hours of travel, layovers, and a night asleep on the benches of Toronto Airport’s Terminal 3.
after interaction. I met more students – these ones were American – who were here to learn about public health in a East African context; some of whom arrived a day before me. We started with a great presentation on the history and work of Kigezi Healthcare Foundation (KIHEFO), an organization that does amazing work in providing health care to the four districts of Kigezi. In addition to their permanent clinics – medical and dental care, HIV/AIDS, child nutrition – in Kabale, KIHEFO does several outreaches each month in surrounding communities. In the afternoon, we were able to actually tour these clinics and the town of Kabale. The town is flowing with hills, houses set into them like blocks, with stores and the artery roads running through the valley. Over the next two days, we were given presentations on the health care options in Uganda, which range from village health teams and traditional healers to formal national hospitals; and on the conditions mothers face in during their pregnancy, during childbirth, and while caring for children. Thursday allowed me to start looking at the Village Nutrition Surveys that have been developed to find out what families face in Kigezi. With questions covering access to water, illness, foods consumed, and household assets, it will allow KIHEFO to have quantifiable data for future initiatives in their communities. I was invited to add additional questions related to water access and sanitation facilities, so that information from these sectors could also be used in future planning. The last day of the week gave all of the new arrivals, including myself, our first look at village life in Uganda, with a tour of a primary school in Ibumba. After speaking with teachers and having the most amazing welcome by their students, we traveled a short distance away with the school’s deputy headmaster to speak with a women’s group that she is leading. Together, this group of widowed and orphaned women have found strength. They farm together, save together, and learn together. They also helped us learn, by describing the challenges they face in their remote community. The weekend gave me time to rest, relax, and do a few errands. On Saturday, I started the process of making some custom shirts with local fabric. Two yards of fabric, which comes in amazingly bright patterns, sells for 10,000 Ugandan shillings (or $4). This is enough to make a single men’s shirt, tailored to your exact measurements, costing an additional 20,000 shillings (or $8).On Sunday, I washed clothes. To hand wash clothes completely and in a reasonable amount of time is an art form; I am not there yet. Looking forward, the second week will see me going out into communities and participate on maternal and child health surveys. There will also be the opportunity to discuss new ways of small-scale agriculture with local youth. Both of these projects have me excited to learn more about Uganda and the issues that people live with each day. Last Thursday, I was fortunate enough to go on a field visit to Sonyo and assist in the inspection of a newly completed government project. 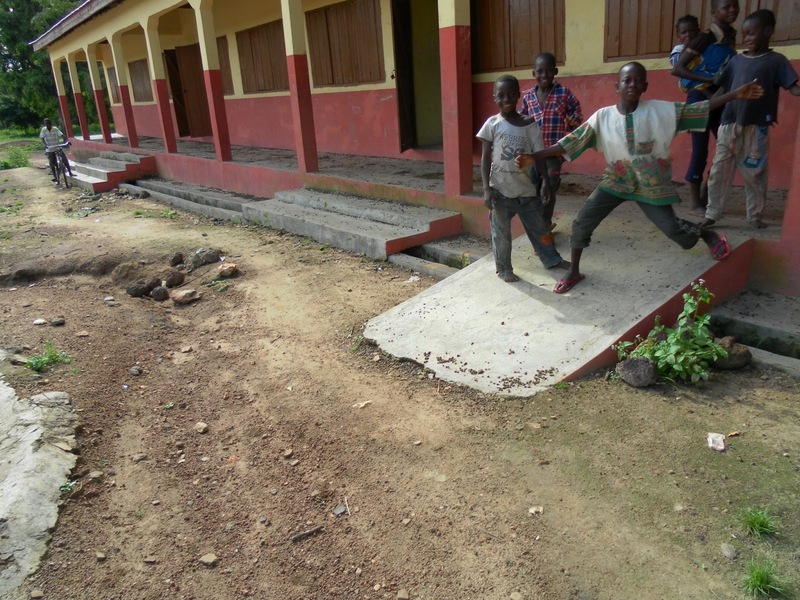 It this instance, the project was a 3-unit classroom block intended for Upper Primary grades. The project was completed nearly 6 months ago and the purpose of this visit was to record any defects for the contractor to correct. In attendance was the District Planning Officer (DPO), the District Budget Officer (DBO), the Planning Officer from Ghana Education Services (GES), the school’s headmaster, the contractor, the district’s driver, and myself. The district officers were quite happy to highlight the inclusion of an access ramp for people with disabilities at the entrance of the new facility. These are mandated from the national government for all new educational structures. As with most times, whenever my camera comes out, so do the children. 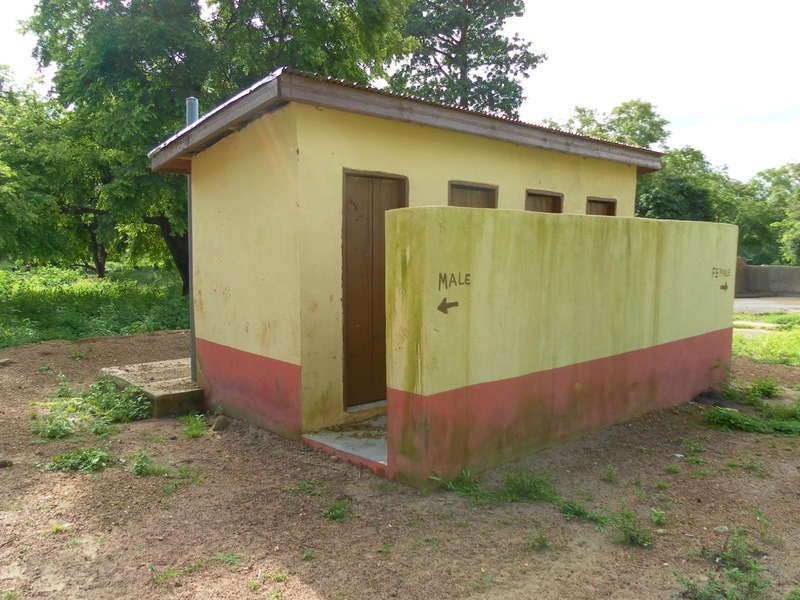 Along with the new classroom block, the project also included for the construction of urinals (not shown) and a series of Kumasi Ventilated-Improved Pit (KVIP) Latrines. There are 2 private rooms for boys and 2 private rooms for girls. On the left side of the photo, you can see the concrete septic tank behind the structure and just a portion of the pipe providing ventilation. There are 4 separate tanks, each having its own ventilation pipe. These facilities provide a safe and sanitary environment for the children, so that they can focus on their studies. All of the structures were completed with excellent craftsmanship and were seen to be in regular use by students. Sonyo does not have a SHS yet. So, there are a total of 11 classrooms, ranging from KS to JHS. All are within sight of each other. 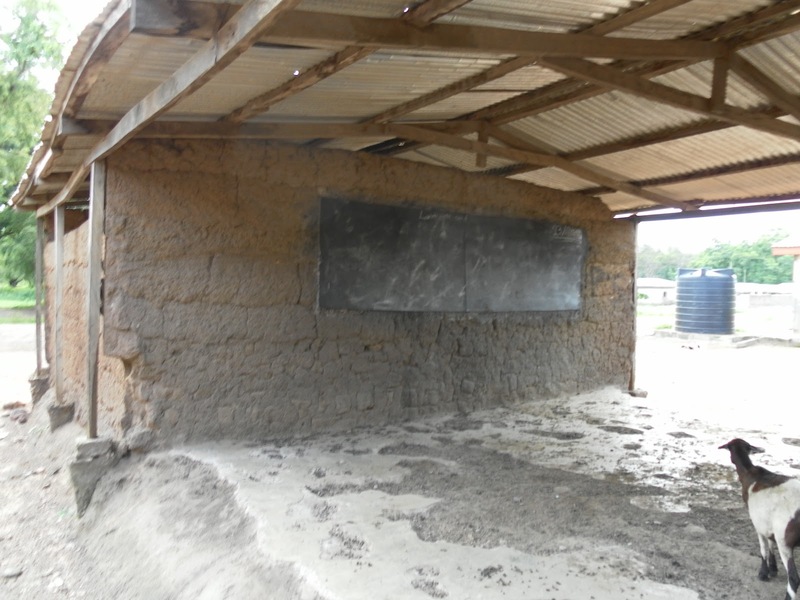 The old Upper Primary classrooms constructed as an open air structure, made up of mud bricks, wood, and a metal roof is located just behind the new structure. 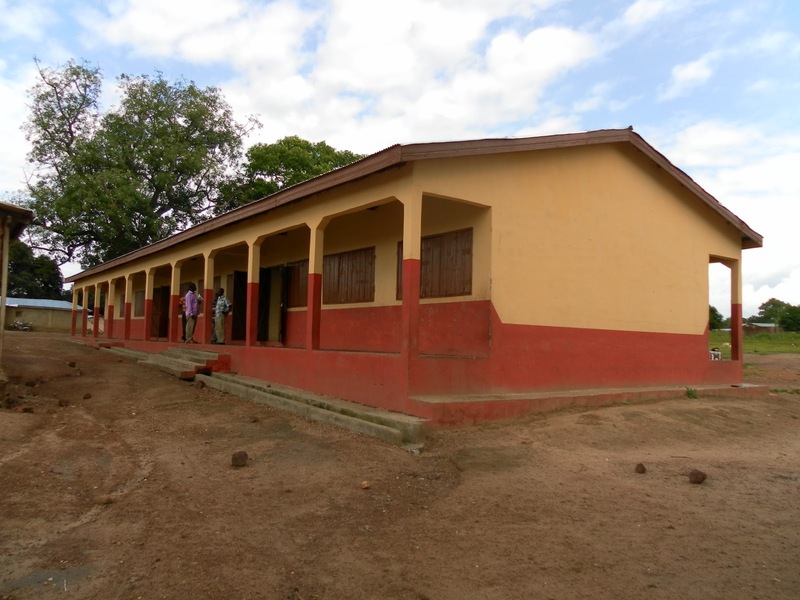 Then there is the Lower Primary classroom block and behind that, the headmaster’s living quarters (not shown). Because of the new structure, the old classrooms can now be used to teach the KG students. 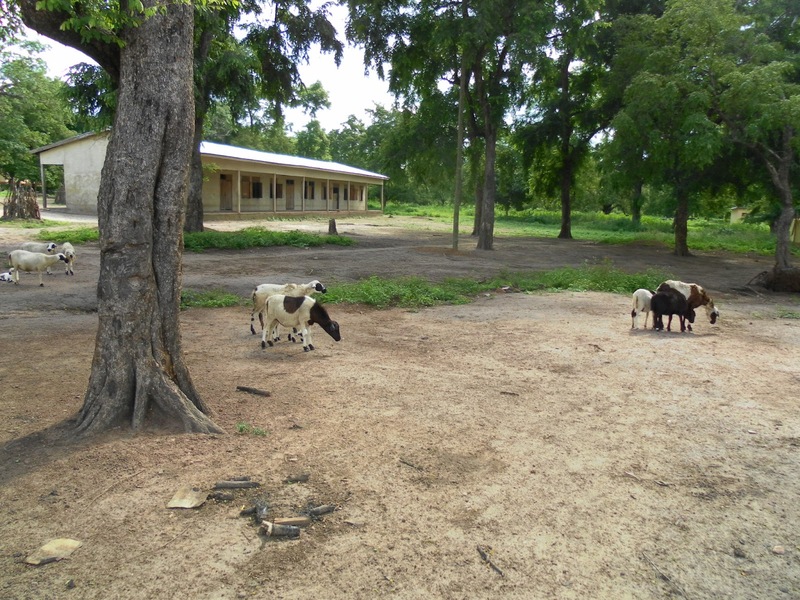 The Junior High School is just a short walk away, through a pack of goats and sheep. At the end of our tour, I talked a little with the GES Planning Officer and school headmaster, who collectively gave me some insight into the make-up of the schools. There are a total of 387 kids attending the different classrooms. This means that on average there are 35 children in each classroom. Oddly enough, GES uses this same value of 35 to determine the ideal classroom size when planning for future development. I will also be using this figure many times when analyzing the data my department has on hand. On the way out of town, we were able to pass the teachers’ quarters. A new structure with 3 self-contained units. Located on the main road and just a few minute walk to the school, this building seems to be ideally positioned to give teachers an easy commute to work and an enjoyable living during the school year. 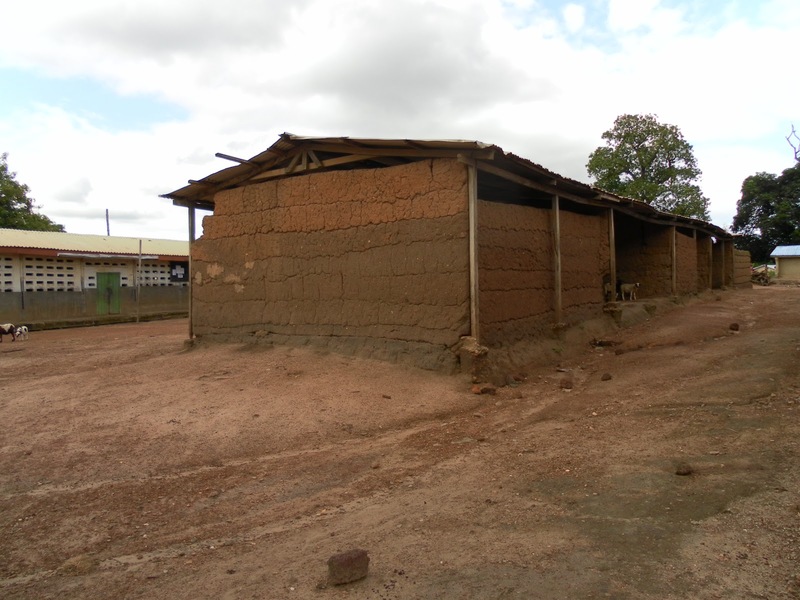 These buildings and the 8 teachers on hand will give Sonyo’s school children the tools they need to gain a great education. I’m looking forward to what the future has in store for these bright young minds.